Geared for travel or active daily life in warm temperatures, the button front Tranzat SS Shirt delivers cool, airy comfort and natural odour resistance. With a clean, simple design in classic plaids, it easily moves from mountain town to overseas trek. The Relaxed fit maximizes airflow, and extends freedom of movement. * Ryan™—92% cotton, 8% wool, 92 g/m². A rich, comfortable blend of cotton and wool in a lightweight twill weave. * Machine wash in cold water or dry clean. 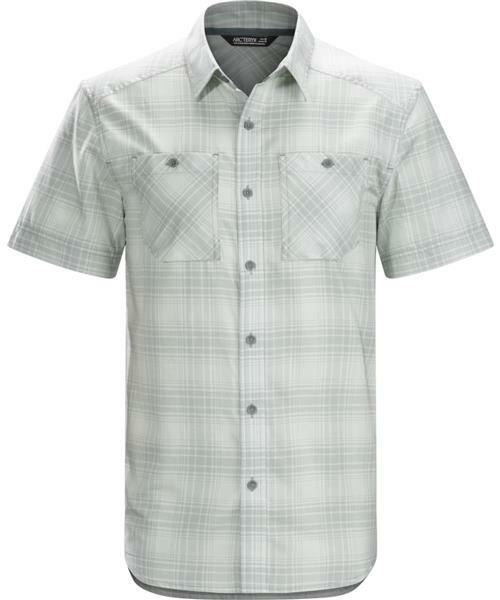 Tranzat SS Shirt - Mens is rated 4.3 out of 5 by 3. Rated 5 out of 5 by cortesbugslayer from Pewter, large I'm a lanky six-two, 215 lbs, and I love this shirt in a large. It fits beautifully and is well constructed, too; no boxy feeling, nor excess material. All of the patterns match perfectly on pocket placements, and this is, no doubt, my favorite shirt. The blend of wool and cotton is outstanding, making for a nice drape and feel. If you want to pay the money, you will get a great shirt. I'm going to buy it in Blue Python next. I've bought a lot of Arc shirts, because of the great fit, and this one is one of the better ones they make, but they are all good. Rated 5 out of 5 by Bretty from Great shirt. Just love it I bought the Umber color (orange) and it keeps it's color very well. A light, low iron takes any wrinkles out of it well. I really like the color. Very comfortable. Sweat dries quickly.